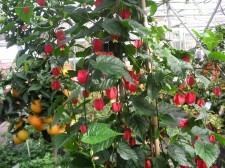 Decorative red and yellow pendulous bell shaped flowers through most of the year. Grows well against a wall or frame. 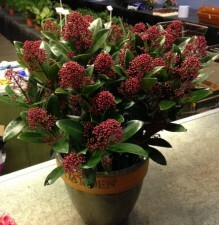 Easy and rewarding plant for cool conservatory or summer patio. Best above 0c, but can grow outside in mild areas. 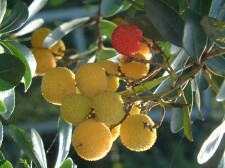 Strawberry Tree. A shrubby evergreen tree with interesting red shedding bark. Small white pink tinged flowers with edible red strawberry like fruits in autumn. hardy. height up to 3m. Sun or shade. 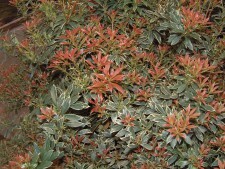 Variegated form with bright red, young leaves which develop silvery-white edges, contrasting beautifully with the older leaves. In mid and late spring, clusters of pretty, white, nodding bell-like flowers, resembling lily-of-the-valley appear. This compact shrub looks wonderful in a shady shrub border with well-drained, acid soil or in a container in a patio or courtyard garden. 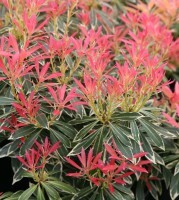 Little Heath is a dwarf variety of pieris. It is a neat little shrub with short, elongated, pointed leaves of mid green colour with white margins. New leaves emerge orange to copper red. 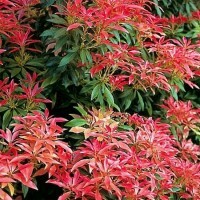 It grows very slowly and forms a compact shrub without pruning. Ideal for order or container (ericacious compost). 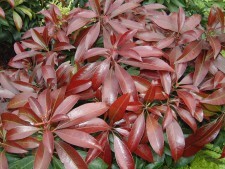 Superb compact evergreen shrub an ideal low maintenance plant suitable for containers or border . Dark green foliage provides a foil to the masses of pink buds which appear in autumn and are held over winter providing interest. In spring the buds open into groups of sweetly scented creamy white flowers. Ideal for coastal conditions and shaded areas. Preferring a well drained neutral to acidic soil. Height 1m.